Official Japanese website outlines new features. New System – Following the Brave & Default style of battle offered in the original game, this game is equipped with a new battle system from the sequel currently in development. Updated User Interface – A complete UI overhaul. Compatibility between jobs and equipped items can be seen on the equip screen, for example. Enhanced Battle Tempo – Thanks to minute adjustments made to motion and effect, the speed of battles has increased. With replay available at up to four times normal speed, the pace of battle has dramatically increased. Once the auto input function is activated, commands that you entered during your previous turn will repeat automatically. Leveling up and battling foes with higher levels is now easier than ever. Event Viewer – Scenes that have already taken place can be replayed any time during the game. Multiple Language Options – Voices in Japanese and English, and text in Japanese, English, French, Italian, German, and Spanish. Bravely Default Data Compatibility – Import your data from the original game. Choose to transfer your level, jobs, job level, money, items, Genome abilities, and D-Notebook. More Save Slots – The original game only had one save slot. For the Sequel offers three. More Configuration – Configure more options, such as difficulty settings and enemy counter rate. Better Town Graphics – In order to give the player a better feel for the character and charm of towns, town maps have been redrawn. Improved Party Chat – Characters who lacked variety in the original game now have facial expressions. Designed to match the flow of conversation, characters will reveal their emotions. Chapters 7 and 8 Revisions – The episodes and battle events about the Asterisk holders have been expanded. Considering the multiple language options, it might not be too far-fetched to guess the upcoming western version of Bravely Default is actually For the Sequel. 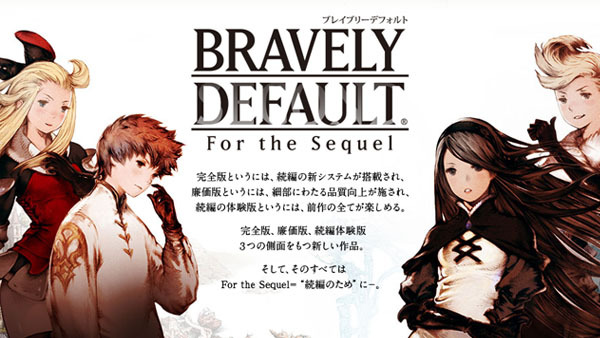 Bravely Default: For the Sequel is due out on December 5 in Japan.